Blondell O'Henry is the most hated woman in Savannah, having been put in prison convicted for the murder of her eldest daughter, Amity O'Henry, and the attempted murder of her other two young children. Twenty years into the present, she is now being released on the grounds that her son is recanting his testimony, given when he was just a child. Apparently, the entire investigation had been a weak one, relying solely on the testimony of Blondell's son, Niall, telling the entire world that his mother was the one who'd held a gun out at him and opened fire, that his mother was the one who'd shot and killed Amity. Setting aside the fact that the legal system often times regards children's testimony as unreliable because of how easily influenced they can be at a young age, I guess this just goes to show that if you get the right jury and the right circumstances and biases together, anything is possible. And now that Niall O'Henry is claiming that, when he was a child, he'd been coerced into testifying falsely against his mother, the entire case has fallen apart and Blondell will be released from prison. Meanwhile, because of this big news, we get to see Nikki Gillette and Pierce Reed once again, both investigating the "Case of the Century" for each of their own individual professions. Nikki is out to write her third true crime novel as well as fill in with a new series for the Savannah Sentinel, and Reed's job is to re-investigate the case with fresh eyes to determine whether or not Blondell needs to remain behind bars. The entire book centers around this investigation and re-investigation... a whole merry-go-round of continued rehashing and repeating and recapping of facts and evidence and testimony... again and again and again. I like crime thrillers; and I've ever only read two true crime novels. I don't know exactly what kind of format they're written in, but for a while now I've been more interested. 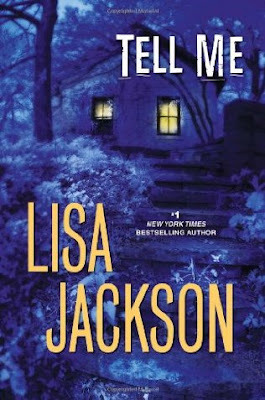 While reading this book, I was almost wondering if Lisa Jackson was going for a "true crime format" for this Romantic Suspense... if there is such a format. It certainly didn't really follow the standard Romantic Suspense formulas, but then again, Nikki and Reed were already an item, having started their relationship in the previous book. So I wondered if Jackson was trying for a semi-true crime type of story format. I might have been thinking too much on it. Anyway, what I'm trying to say is, despite being intrigued by the concept of Tell Me, I found the book to actually be kind of monotonous and boring. While the previous book flew by quickly, this one seemed to settle back into a game of repeating facts and information so many times that I could probably recite word-for-word all the testimony and evidence in the Blondell O'Henry case. Kind of like how the first book in this series had been written. The events kept repeating themselves and we constantly found Nikki sitting around going over facts in her head, calling up witnesses and persons of interest, getting to a blockade in her investigation, fighting with Reed about sharing information from his side of the investigation, and then repeating the entire cycle at least twice more for the first half of the book. I got so bored I started reading other books. The last half of the book began to get more exciting when new progression developed, but it was still monotonous and I was already lost on interest by then. Overall: An okay book that had a promising concept, but kind of just flat-lined. This review was originally posted at Ani's Book Abyss / BookLikes in October 2014.